Spirit of Jack London to fade away? Will the spirit or ghost of author Jack London fade from our sight next year? Whether or not you believe in such things, isn’t the question. It is true that Jack London State Park in Glen Ellen is on the list of California state parks to be permanently closed next year. Here’s a link from the Redwood Writers branch of the California Writers Club explaining further. Thank you to Lynn Millar, Web Editor for Redwood Writers for providing this connection to part of our writing heritage: http://redwoodwriters.org/jacklondon/ (NOTE: Jack London was one of the founding members of the California Writers Club over 100 years ago.) Lynn has posted a slide show of photos from the park on the Redwood website. Whether or not you are willing or able to make a donation to help keep the park open, perhaps you may find time to go enjoy the park this fall. 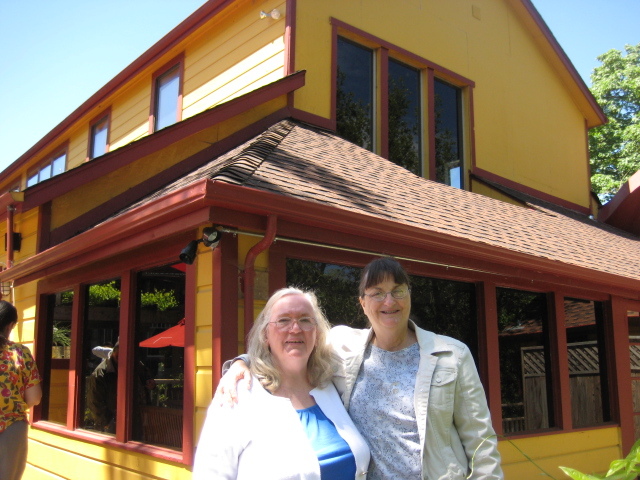 Arletta Dawdy and I posed below the upstairs office of Jack London at the Grist Mill. This entry was posted in authors, California Writers Club, ghosts, great stories, Horses, Jack London, Kids' stories, poets, Ponies, Sonoma County, State Parks, Writers, writing. Bookmark the permalink. 9 Responses to Spirit of Jack London to fade away? This summer, I visited London’s Wolf House ruins (inside the park). A volunteer guide told us stories about London and his wife, then we were led to a hillside where London is buried, a fenced pioneer site. Then we visited the couple’s cottage and bought a few of London’s books from the CA State Park staff. I loved looking at London’s library/office, which are so lovely that I never wanted to leave. Thanks for posting this and the link to donate. I’m sharing this now. Thank you, Deborah! Perhaps if we all pitch in and spread the word about the park’s closing we may ending up saving it. Hey Robin, Do any of the trails take us to the museum? Just a thought for the Oct 30 ride. I’ll look into that question, Barb. Thanks! Jack London State Park has long been a favorite of mine. I have walked those paths, laughed at the pig palace, and imagined myself a crony of Jack’s, swimming in the lake. I have stood in the shadowy green ruins of the stone Wolf House and wondered at what might have been, and the mysterious fire that took it down. I have been there in the Spring, with my mother and sister, the Fall with my long deceased friend and in the Summer, to paint with a painter friend. The light is ever-changing and the path choices of vines, oaks, eucalyptus, redwoods and ferns makes this a place of which I’ll never tire. It’s full of spirits and memories. . . of my friends, my family and Jack. Long live Jack London. Hear, hear! Yes, long live Jack London’s legacy. Nice writing with you today as you kick off the NANO month of writing. I love Jack London Park going back to when it wasn’t actually a park. Thanks for the donation link. I’ll get to it shortly for I really want us to preserve this special bit of history and the great writer it celebrates.